The New Allure - The Ultimate in power chairs! The new Allure has just about every feature you could hope to find in an electric wheelchair. The Allure comes standard with a 20" wide, high back captain seat with headrest with semi-recline feature standard, adjustable height and width arm rests, standard swing away joystick, 12 inch foam filled mid-wheel drive wheels, 6.3 m.p.h. top speed and a 375 lb. weight capacity. 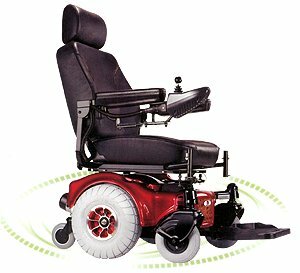 This power chair has an amazingly tight turning radius and an incredibly smooth ride. Add to this the sleek, sporty design and what more could you ask for?!!! Available in red, blue and silver. Powerful, 24 volt DC Permanent Magnet. Height and width adjustable arm rests. High back, 20" wide seat comes standard with head rest and semi-recline feature. 50 Amp Dynamic Commando controller. The Allure breaks apart into 5 easy to handle pieces for transport! Brakes Electromagnetic - fail safe. Battery Two 12-volt, gell cell sealed.